We are pleased provide you with an update on our NationWide Self Storage (NWSS-I) property located at 1223 E Pender St, Vancouver BC (Pender Property). 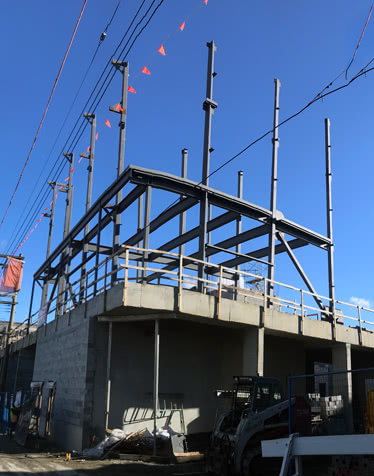 Throughout the summer much progress has been made on our Pender Property from the completion of the foundation to the progress of the walls being erected. Our original targeted completion date was Q4 2018, however we experienced delays in the issuance of our building permit from the City of Vancouver. In addition, there has been a shortage of steel workers due to the ‘construction boom’ in Vancouver which has caused a 4-6 week delay in construction. The steel worker issues have now been addressed and the project is proceeding smoothly and on budget. Our targeted completion date at this point is the end of Q1 2019. Download the full investor update to learn more about our upcoming Pender Property self storage facility. We are pleased to announce that we have launched a new Pender Property Overview page on our website where you will find all relevant project details, the latest investor updates and our latest architectural drawings and building pictures. The information provided is general in nature and is provided with the understanding that it may not be considered tax, legal, accounting or professional advice. There can be no assurance that investments will perform as forecasted or be of the quality anticipated. There are tax risks associated with an investment. The content of this page is for information only and does not constitute an offer to sell or an advertisement, solicitation, or recommendation to buy securities. Nothing on these pages constitutes investment, legal or tax advice, nor was it prepared in consideration of the investment objectives, financial situation, particular needs or any specific recipient. Qualified investors should read the relevant Offering Memorandum carefully and consult with their tax and investment advisors before making an investment decision. Next Post NationWide Self Storage & Auto Wash Trust, Kamloops Update No. 2/2019 – Build Permit Received.